Peak oil has already had a major impact on U.S. society. Rising gas prices, and the realization that the gigantic cars manufactured by the U.S. auto industry were unsustainable, caused the collapse of some of the largest corporations in America. The American auto manufacturing industry was so unsustainable that doubling the price of gas caused an almost complete collapse of the industry within one year. Many people lost their jobs, most of them for good. High gas prices in 2007-2008 led to many public protests and riots worldwide [i]. Oil prices are projected to increase substantially in the “business as usual” scenario, from $80.16 in 2010 to $110.49 in 2015 and $121.94 in 2025 ((EIA 2009), Table 16, pg. 88). As the title of Richard Heinberg’s book on peak oil suggests (2005), “The Party is Over,” and life is going to get tougher. · Adapt a new energy supply – e.g. ethanol. · Changed cultural aspirations- e.g. buy a house in the city, no need for a car. These four changes will work together to reduce energy demand. Alternative energy will never replace oil for transportation, and we will face a decline in the four ways above (http://transitionculture.org/2006/08/25/dennis-meadows-limits-to-growth-and-peak-oil/). As a result, many who study Peak Oil believe that people will essentially be stranded in the suburbs due to oil shortages, and will be forced to migrate out of the suburbs (e.g., see the interesting movies “Sprawling from Grace” (Edwards 2009) and “The End of Suburbia” (Greene 2004). However, it seems unlikely that people will abandon the suburbs in response to peak oil, as there will be alternative methods of transportation such as electric cars, which as of 2011 are already becoming widely available. Peak oil will also reduce food supply and economic capital. As people adapt to preserve economic capital, the changes will become social as individuals work together as communities to adapt to an oil-free, low energy lifestyle. Transport of food and goods currently depends on liquid fuels; Peak oil will sharply curtail transport, creating a gap between supply and demand of food and goods that only increasing local production can fill. The environmental consequences of Peak oil and the costs of our oil dependence are well illustrated by the Deepwater Horizon oil spill in the Gulf of Mexico in 2010, the largest marine oil spill in the history of the petroleum industry. The Deepwater Horizon rig was drilling 41 miles off the Louisiana coast in water 5,000 feet deep when it exploded on April 20, killing 11 platform workers. Before British Petroleum (BP) capped it on July 15, 4.9 million barrels of crude oil had gushed from the drill hole, causing widespread damage to shorelines and fisheries. The federal government closed nearly 36% of federally-owned area in the Gulf of Mexico to fishing, costing the fishing industry billions of dollars. The U.S. Travel Industry estimates that the three-year cost to lost tourism could exceed $23 billion. Costs to BP had risen to $3 billion by July 5, 2010. A clue to how the spill relates to Peak oil is contained in the name: the Deepwater Horizon was in deep water because oil companies had already drilled all of the shallower, easier to drill locations. Drilling for oil is becoming riskier and more expensive as we are forced to mine more extreme environments; the easy oil is already gone. The social costs of oil use also deserve closer inspection. In his book “Hot, Flat, and Crowded” (2008) Thomas Friedman argues that the global dependence on oil has made the oil states powerful, and that power has prevented or even reversed political reforms. In (Figure 1.) 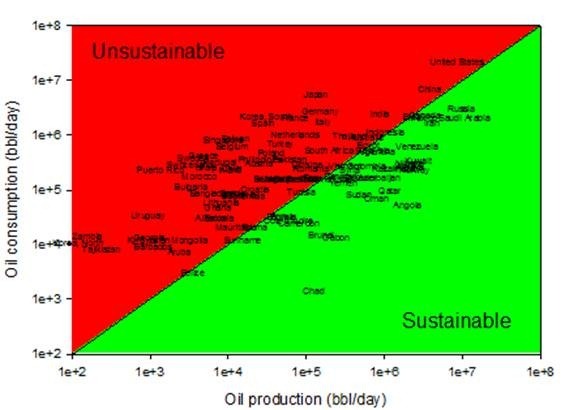 the countries that produce more oil than they consume plot in the green “sustainable field,” where we refer to the ability of a country to meet its current needs. Countries in the green field export oil, and countries in the red field must import oil. The dependence of countries like the U.S. on oil from countries in the green field has caused many social problems, including decreased national security of importing states. Of the 23 countries that get the majority of their income from oil and gas, none are democracies (p. 105). Saudi Arabia, Iran, and Russia can treat the U.S. with impunity because oil income has made them powerful. Friedman’s First Law of Petropolitics states “In oil-rich petrolist states, the price of oil and the pace of freedom tend to move in opposite directions… Petrolist states (are) authoritarian states (or ones with weak state institutions) that are highly dependent on oil production for the bulk of their exports and government income ((Friedman 2008), p. 96).” Governments of petrolist states get their money from oil sales, not taxes, and they use the money to placate their citizens through subsidies. If the price of oil plummets (which seems unlikely), governments of petrolist countries like Iran will likely collapse. Peak oil is likely to strongly hurt businesses that depend on transport by truck or plane. If you are a trucker, work in the airline industry, for FedEx or UPS, or for big box stores like Wal-Mart, you should start formulating a backup plan in case you lose your job. Obviously if you are an investor you don’t want to invest long-term in companies that make money primarily through transportation. New jobs in sectors like local food production will open up to close the supply-demand gap for transported goods. The post-peak world may be like living in the U.S. during WWII. Americans were resource-constrained, and there was energy rationing (no new cars, limited gas). People grew victory gardens. WWII was an emergency, but not the type we are used to, the kind associated with natural disasters. Rather, it was a “long emergency,” to use James Kunstler’s phrase, and that’s the type of emergency that will confront us. The repercussions and responses to Peak oil will stretch out over years. Yet like natural disaster emergencies, when people band together and work toward a common cause, the Peak oil emergency may help rebuild communities. It may reverse many negative trends of the 20th century such as depersonalization and centralization. The U.S. is particularly vulnerable to the challenges presented by Peak oil because it has a low population density, and because the U.S. built its cities for cars rather than people, leading to urban sprawl. Australia is even more vulnerable because transportation distances within Australia and to its trade partners are even greater than in the U.S., and it is more dependent on petroleum-based fertilizers to produce its food. In conclusion, Peak oil is one of the biggest challenges facing humanity in the next several decades. As global oil production decreases and demand increases, the price of oil and of all goods that use of oil or oil-derived energy in their life cycle will skyrocket. Sadly, people will be forced to abandon marginal living areas that petroleum made livable, such as big chunks of Australia. But out of the Peak oil crisis may emerge a new, more rewarding lifestyle, if we prepare for change. Bates, A. (2006). The Post-Petroleum Survival Guide and Cookbook: Recipes for Changing Times, New Society Publishers. Edwards, D. M. (2009). Sprawling From Grace: 82 min. EIA (2009). Annual Energy Outlook 2009, USDOE: 230. http://www.eia.doe.gov/oiaf/aeo/pdf/0383(2009).pdf. Greene, G. (2004). The End of Suburbia: Oil Depletion and the Collapse of the American Dream: 78 min. Heinberg, R. (2005). The Party’s Over: Oil, War and the Fate of Industrial Societies, New Society Publishers. This entry was posted in Fossil fuels, Peak Oil, Resources and tagged oil. Bookmark the permalink.